All events open to the public and free of charge! The Caetani Cultural Centre and Vernon Community Arts Centre are pleased to announce our new visiting ceramics artist Wendy Nichol. Hailing from Toronto, Wendy is the Caetani Centre’s newest CeramAIR (Ceramics Artist in Resident). 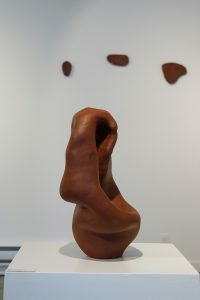 While she has been staying at the Caetani Cultural Centre, she has been working out of the Vernon Community Arts Centre since the beginning of January, continuing her explorations into clay and process. Her work will culminate with a solo exhibition in March. The major component of my project is the following process based practice. I’m interesting in finding a balance between motion and stillness through the process of hand-building vessels and forms. I begin with a slab base and start adding coils. At around 6 to 7 coils, I blend them together, refining the surface through pinching and smoothing. After ensuring a consistent thickness, I build up the walls, repeating the process until the form feels exhausted. Then I squeeze and flex the walls of the vessel, forcing them to their collapsing point. I add foam supports and step back to let the vessel dry to leather hard, freezing the collapse. I finish the surface by burnishing the walls of the vessel with plastic ribs, inside and out. Depending on the vessel, I approach the surface treatment with a variety of techniques: carved freeform patterns, painting coloured slip or underglaze then carved texture, or gestural painting with slip or underglaze. I plan to work through a variety of surface design techniques by experimenting with the glazes provided by the studio. I am looking for colour ways that embrace the stillness of the collapsed walls and give emphasis to textured surfaces. 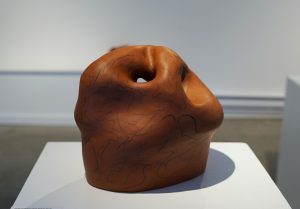 In my current practice, I think about letting the surface of the clay reveal its process of construction. I burnish the surface of each vessel to polish the layers of coils, softening the hardness of the form. Remnants of coiled layers of clay that build up the walls of each vessel are present and reveal a shadowed imprint. 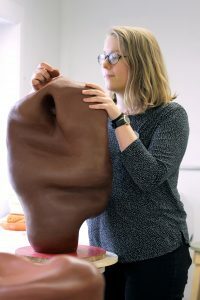 Wendy burnishes the surface of one of her sculptures, 2018. CeramAIR is a ceramics-based residency and partnership between the Caetani Cultural Centre and the Vernon Community Arts Centre/Arts Council of the North Okanagan in Vernon, BC. The program provides regional, national, international ceramic artists the ability to work in a supportive community environment of like-minded individuals from our own arts community, to share their expertise and vision, to inspire excellence and create work at the highest level in a nurturing and creative environment. The artist is provided with accommodations at the Caetani Centre, and is also provided with use of a shared studio workspace and equipment at the Vernon Community Arts Centre (VCAC) operated by the Arts Council of the North Okanagan (ACNO). The residency is a multi-faceted experience that includes opportunities for teaching, community outreach, interaction with other artists, and studio care, and culminates in an exhibition of new work.